Either way it's a money-saver! 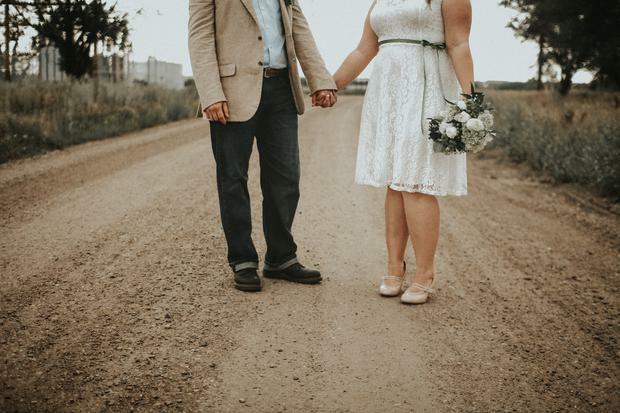 When Emma and Matt Willis celebrated their ten year anniversary by renewing their vows and inviting all their friends along to celebrate, wedding etiquette was turned on its head. The couple, who have two children together, had been dreaming of holding a 'wedding 2.0' since they tied the knot back in 2008, with the bride saying she enjoyed the day so much she wanted to do it all over again. On their big day the pair were asked 'where do you see yourselves in ten years?' to which the bride responded; "Hopefully still together, and if we are we'll come back here and have a party!" And so, for their tenth anniversary the couple returned to the 15th-century stately home Rushton Hall, in Northamptonshire, UK, to do it all over again - but this time things were a little different. While 'bride' Emma wore her original Phillipa Lepley wedding dress, the couple's married female guests were also dressed in big white gúnas - their own wedding dresses from their respective nuptials. "She made us all wear wedding dresses," the bride's best pal Rochelle Humes of girlband The Saturdays told PA, "It was so nice. You don’t often get the chance to wear it again." What a magical day !!! Yesterday I was back in a Wedding Dress to celebrate 10 years of @emmawillisofficial @mattjwillis marriage, their day really was as special as they are. Here’s to many more...💎 P.S I’d marry him again tomorrow.. While others clearly jumped at the chance to give their gown another outing for the day, Rochelle explained that rather than 'depress' herself by trying her original wedding dress on, she instead opted to to get a loan of one. “I was 23 when I got married," she said, "I’ve had two kids, I didn’t have hips before. There is no way I could get into it. I wouldn’t be able to zip it up!" the singer, who herself tied the knot just over six years ago, said. While it mightn't be ideal for a wedding vow renewal, it's certainly doable for a fun at-home hen or bridal shower - if Holly Willoughby can wear her wedding dress to watch the royal wedding surely we can find more occasions to break out the pricey piece of material?! Emma and former Busted star husband Matt exchanged their vows for the second time in their original wedding venue, before wedding-dress-clad guests headed back to enjoy some childish fun on a big white bouncy castle the couple had hired for the day. Incidentally, the big white wedding bouncy castle is another trend we're predicting will become a huge trend for summer 2019 weddings - so there you have it, two insanely fun trends for the price of one. Would your pals jump at the chance to wear their wedding dress again? They could get an opportunity to at the upcoming 'Rock the Frock 2018' charity event taking place in Dublin this September. Find out more here.